Twitter allows you to run custom audiences, and target promoted tweets at these audiences. With our Twitter integration, you can pass Permutive Segments over to Twitter for targeting users on their timelines and through Twitter's Ad network. The setup requires work in Permutive and the Twitter Ads platform. It's important to ensure you have access to both before starting. 5. When saved, you'll receive a Website tag. From this JS tag you'll need to save the audience tag ID highlighted in the red box below (usually beginning with 'o') to set up reactions. The next step is to ensure people are added to the Twitter Audiences correctly, matching your Permutive Segments. At this stage, we'll assume you already have your segments set up. If this isn't the case, you can learn more about Permutive segments here. To get a segment into Twitter to use as an Audience you'll need to set up a Reaction. Go to the Reactions section of the Permutive Dashboard. Click + Add Reaction. Select 'Twitter' under Action, then fill in the details. 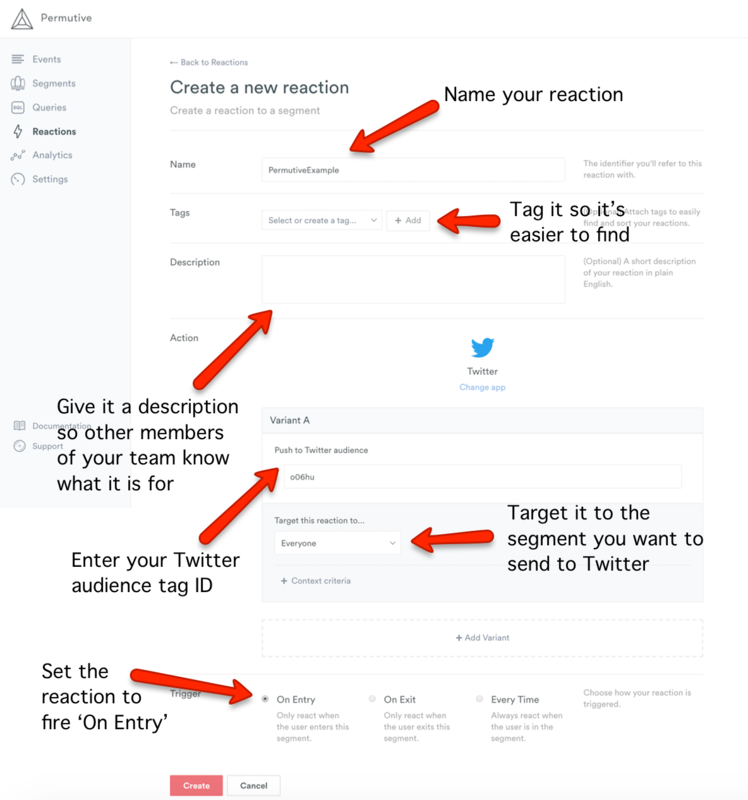 Give the Twitter Reaction a name, enter the audience tag ID (the ID beginning with 'o') and pick the segment you want to target. Set the trigger to 'On Entry'. It should look like the screenshot below. Then click create. 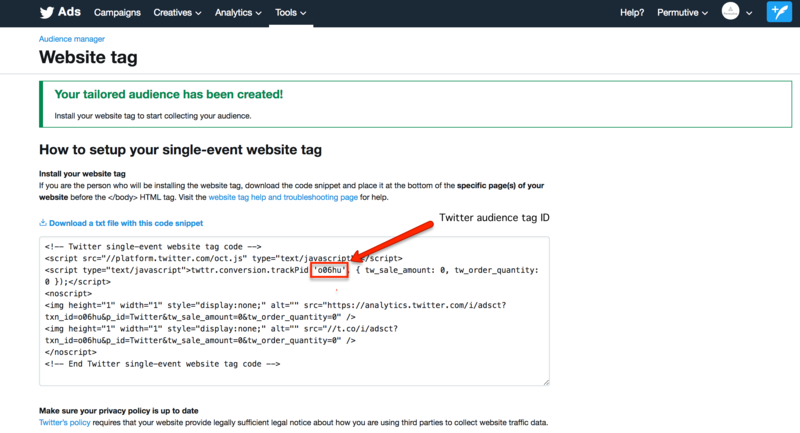 When you return to the Twitter Ads dashboard, you'll see your Website events tag in the Conversion tracking list. As soon as a user triggers the reaction, it will go from unverified to verified. Now, go over to Tools > Audience Manager. Here you will see the audience related to the tag you just created. As soon as users start populating the audience you can check it's size here. 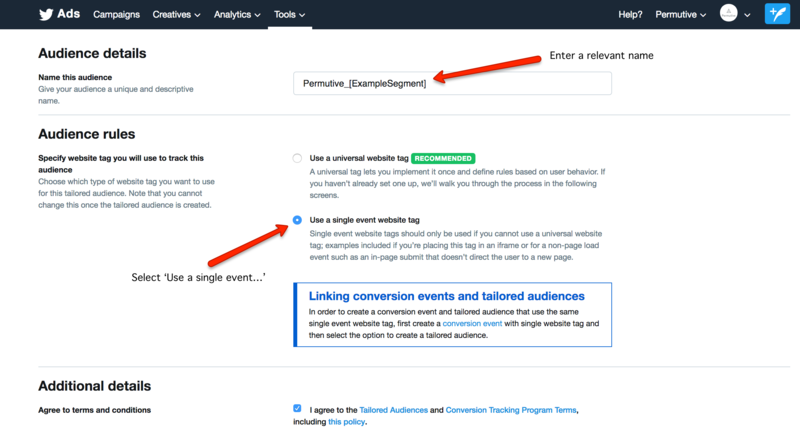 When creating a campaign, you can find your audience under Tailored Audiences (web) in the Targeting section. If you have any questions, or want help getting set up feel free to email us support@permutive.com or contact us over LiveChat.